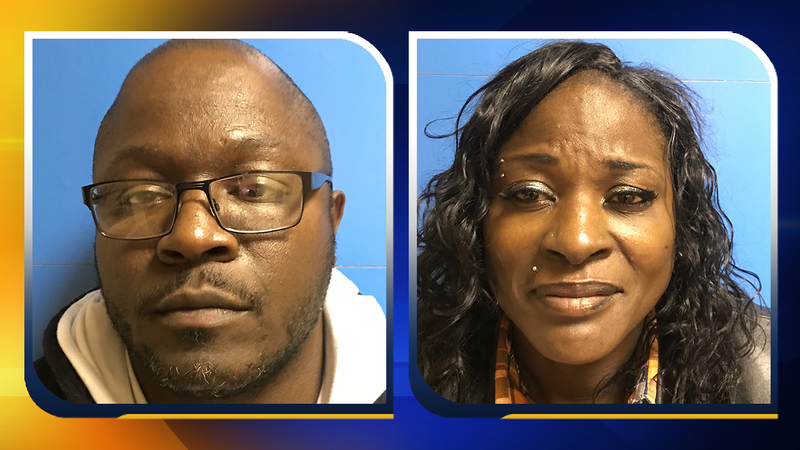 ENFIELD, North Carolina (WTVD) -- A Rocky Mount couple stopped for speeding on Interstate 95 is facing more serious charges after law officers seized drugs and a gun during a traffic stop. It happened Friday night about 10:45 p.m. when Halifax County Sheriff's Office Deputy W.H. Wheeler stopped a speeding 2005 Dodge Durango going south on I-95 near mile marker 159. Wheeler identified the driver as Anthony High, 39, and the passenger to be his wife, Darlena High, 49, both of Rocky Mount. During a search of the vehicle with the assistance of Roanoke Rapids Police Patrolman Hannah Grimes with canine Jimi and Capt. A.M. Harris of the Sheriff's Office, a loaded Taurus handgun and 24.2 grams (seven individually wrapped bags) of marijuana were seized. Anthony High was arrested and charged with possession with the intent to sell/deliver marijuana and possession of firearm by a felon. North Carolina Department of Public Safety records show Anthony High was convicted in Edgecombe County Superior Court in 1997 for second-degree murder and spent 19 years in prison before being released in April 2016. Darlena High was arrested and charged with possession with the intent to sell/deliver marijuana and maintaining a vehicle/dwelling for a controlled substance. At the Halifax County Detention Center, deputies requested an in-depth search of Darlena High. With the assistance of Lt. Teri Kimball, deputies seized 200 grams of cocaine from Darlena High. Additional charges were obtained for trafficking in cocaine, possession with the intent to sell/deliver cocaine, conspire to trafficking cocaine and possess controlled substance at prison/jail premise for Darlena High and trafficking in cocaine, possession with the intent to sell/deliver cocaine, conspire to trafficking cocaine for Anthony High. The vehicle along with currency were seized. Darlena High received a $55,000 bond and Anthony High received a $100,000 bond. The street value of the cocaine was estimated at about $12,000.